Garmin's latest GPS bike navigator models named the Edge Touring are available in two different models - the Edge Touring and the Edge Touring Plus. The Edge Touring Plus includes a barometric altimeter that will display elevation details and ascent and decent information. Furthermore only the Plus model is compatible with a wireless ANT+ heart rate monitor. Both systems include a compass and are also waterproof and built specifically for use on a bike. They both feature a 6.6cm glove friendly touchscreen and include an OSM Cycle map for 25 European countries. There are also three different modes for different types of cycling and two ways to choose your route which are via destination or distance cycled. Accessories, spares and parts are still available for your Edge Touring model. The Edge Touring is a GPS navigation device for cyclists which includes a map of Europe for cyclists. The Garmin Edge Touring range comprises of two models. These are the Garmin Edge Touring and Garmin Edge Touring Plus. The difference between the two models is the Plus version includes a Barometric Altimeter providing you with elevation, ascent and descent information. The Plus is also compatible with the wireless ANT+ heart rate monitor. Furthermore only the Plus model will display and record temperature whilst you ride. The Edge Touring systems are both built to be installed on a bike. They are waterproof to IPX7 standards and they have a battery life of 17 hours. There are two ways to choose your route with the Edge Touring. These are by ‘destination’ or by ‘distance’. With destination you can select from addresses and cyclist points of interest as your destination and you can choose multiple places to visit along the same single route. Secondly you can choose your route by distance. This includes round trip routing which offers up to three ride options whereby you can choose from 3 alternative routes. You can also select to plan rest stops, find attractions and more. You will receive bike-specific turn-by-turn directions on your Edge Touring system too throughout your chosen route. Both systems include a compass. However only the Touring Plus model includes a Barometric Altimeter. This altimeter will display and record elevation data so you can either view it instantly or download and view it on a computer. It also shows total ascent, total descent and gradient information. There is a free online Garmin community where you can share and download routes. These are Garmin Connect and Garmin Adventures. You can also customise downloaded routes or create new rides. Looking for accessories and spares for the Garmin Edge Touring? 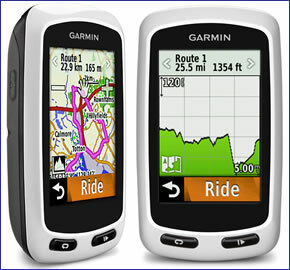 All parts are genuine Garmin product and specifically designed for use with the Garmin cycle GPS Edge Touring device. Discover the optional range of maps that you can add to the Garmin Edge Touring here. Maps available include GB Discoverer Ordnance Survey (OS) mapping, Cycle Map Europe and TOPO topographical mapping. Do you have a question about the Garmin Edge Touring? Submit your question via our contact page.